Combine all ingredients and toss well. Let sit for 10-15 minutes before eating, or chill until ready to serve. Cold pasta + fresh vegetables + vinaigrette = A whole lot of pasta salad lovin’. Make it a cold cheese tortellini pasta and it’s positively swoon-worthy! 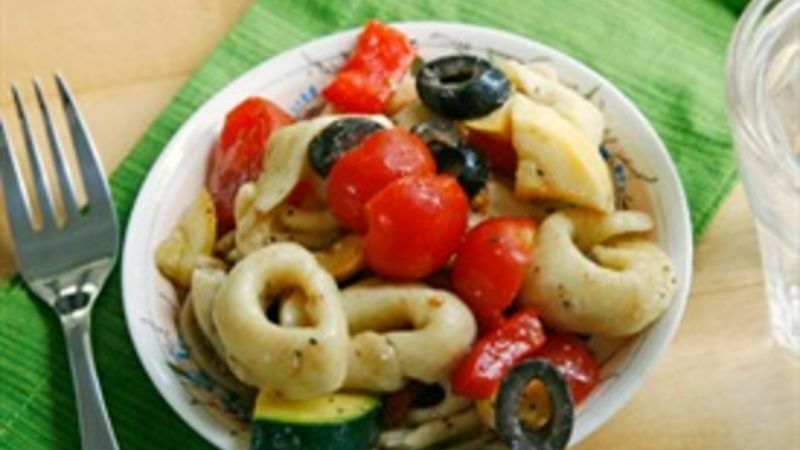 This easy Veggie-Lovers Tortellini Pasta Salad is the kind of summer salad that works equally well on a barbecue table as it does eaten from a storage container at the beach (and totally passed around between friends). Heck, sometimes, this is the salad that you eat a few bites of while standing in front of the fridge to ward off hunger while you’re waiting for dinner. It’s good anytime, and the fact that it’s filled with fresh veggies makes it all the better. Swear. Summer is in full swing now, and that means there is a whole world of fresh, vibrant veggies waiting to be sliced, diced and enjoyed in delicious summer salads. Hit up your local farmers markets for the best summer squash, zucchini, tomatoes and more. These are perfect for mixing into a fantastic pasta (ahem, tortellini pasta) salad. Have you been to your local farmers market yet? If not, then you should definitely make a point to go. It’s a wonderful experience where you can get up close and personal with the produce you’ll be eating – and also chat with the folks who grow it. Don’t be afraid to ask questions, even if they feel silly in the moment. What's your fave summer veggie?